Ashley Freeland, a senior art education major, works on a Wall of Hope canvas panel at the Community Cancer Center. Illinois State students are helping to shape an ambitious communitywide art project that’s weaving together deeply personal “stories of hope” from cancer patients and their families into a single display. The new Wall of Hope at the Community Cancer Center in Normal will display dozens of pieces of artwork when it’s installed around January. Illinois State art and design students are spending time at the cancer center this month, helping patients and families complete their canvas panels and design the final display. One of the students is Ashley Freeland, a senior art education major. She volunteered for the project after getting an email from a School of Art advisor. Her first day at the center was Friday. Ashley Freeland paints a piece titled “Aged to Perfection,” designed by a patient’s sister/caregiver. 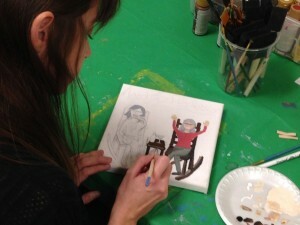 On Friday, she was hunched over a small canvas at the cancer center, painting a piece titled “Aged to Perfection.” Designed by a patient’s sister/caregiver, its depiction of two sisters captures a lot of personality in just a few square inches—their plans to beat cancer and grow old together, complete with gray hair. The Wall of Hope, funded by an Illinois Prairie Community Foundation grant, will be permanently displayed at the Community Cancer Center, both before and after its major expansion now underway. Two smaller versions of the Wall of Hope will also be prepared, including one for traveling display. It’s generated more submissions than the center expected. Thirteen students from Instructional Assistant Professor Wendy VanderNoordaa’s Human Factors in Interior Environments course are tasked with developing five different structural and mounting design options for the permanent display. VanderNoordaa said the Wall of Hope exposes her students to the “human side of design,” a primary focus of her Department of Family and Consumer Sciences course. This is her students’ final project. “It’s the most important civic engagement project we’ve really done,” she said. In addition to the display planning, her students are also working directly with the patients and families. One of her students, senior interior environmental design major Leslie Dale, spent part of her first day at the cancer center Friday talking to a patient’s wife about her design for a spiritually inspired panel. 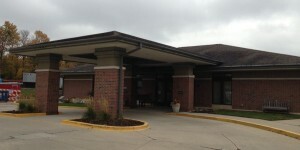 The Community Cancer Center, located off Vernon Avenue east of campus. Other students have also been involved, including an entire graphic design class and several students with an interest in art therapy. Many of those students find themselves collaborating on the artwork, because it’s sometimes challenging to interpret what a patient wants on their panel, said Cheryl Peterson-Karlan, chaplain at the Community Cancer Center and the lead organizer of the Wall of Hope. The Wall of Hope was spawned after Peterson-Karlan employed similar art-inspired experiences in a small support group. She found art could inspire new paths to spiritual and even relational healing.